At Courses & Seminars we strive to provide high quality, in-depth and topical training to professionals and executives. Courses & Seminars is a leading provider of continuous professional training for professionals in the legal, accounting, compliance, risk management and the financial services industries. Since our inception in late 2001, we have organized over 1,500 courses, seminars and conferences which attracted professionals from a broad spectrum of industries to attend. Our courses have been accredited by 15 different professional organizations. We are committed to providing high quality courses, seminars, workshops and conferences to our clients who are professionals in their respective fields. Our seminars and conferences cover many legal and financial topics that are timely, in-depth and insightful. 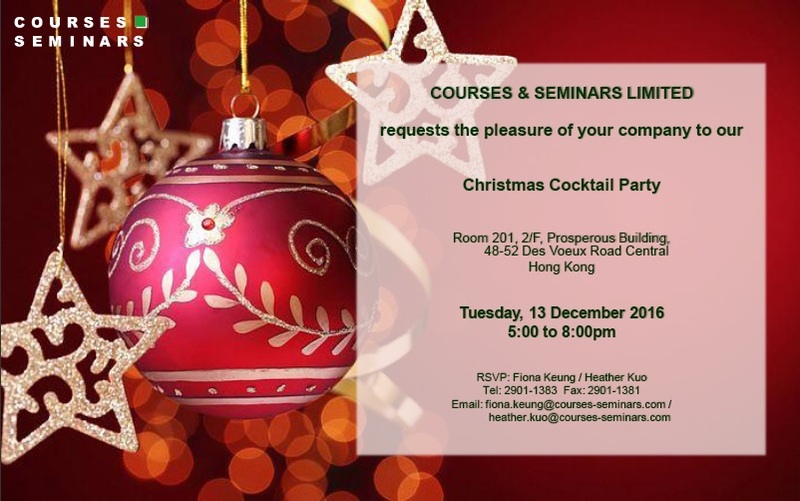 Ms. Yvonne Ho is the Founder of Courses & Seminars Limited. She has considerable experience with regulatory matters, investment funds and banking related areas. Ms. Ho is also the Managing Director & Head of Legal and Compliance at Cheetah Investment Management Limited, a fund management and advisory firm specializing in alternative funds licensed by the Securities and Futures Commission. Prior to this she worked as a regional in-house counsel at Credit Suisse and a solicitor at Clifford Chance, Hong Kong. She has also served as a legal consultant of The Stock Exchange of Hong Kong Limited focusing on enforcement actions. Ms. Ho was admitted as a solicitor and barrister in British Columbia, Canada and as a solicitor in England and Wales and Hong Kong. She holds a BA from Pomona College, California, USA and an LLB from the University of British Columbia, Canada.